within drum circles within drum circles. ​in a universe of inter-rhythmic becoming. The universe is a network of drum circles: circles within circles within circles. The atom is a drum circle; a molecule is a drum circle; the star is a drum circle; a living cell is a drum circle; the human brain is a drum circle; and societies are drum circles. All beings are pulsing with rhythms and beats, influenced by the rhythms around them and within them. Their vibrations are how they respond, rhythmically and in time. In the beginning was not the word. The first sounds of creation were polyrhythms. The Holy Spirit, sometimes named God, is a facilitator of the polyrhythmic, improvisational drum circles. She facilitates by offering cues for how the drumming can unfold, which are felt by the various beings. In process theology these cues are called initial aims: fresh promptings from the Spirit. In life on earth, these promptings are to live with satisfaction, relative to the situation at hand, and in ways that are syncopated with others and enjoyable to all, with no one left behind. They are for what Martin Luther King called beloved communities. That's the kind of drumming the Spirit needs and loves. Beloved drumming. The Spirit is not all-powerful. Drum circles can fall apart. And people can be pushed out of desired circles by the will and "privilege" of a very few. This has happened to so many. They create drum circles of their own, and the Holy Spirit helps them. 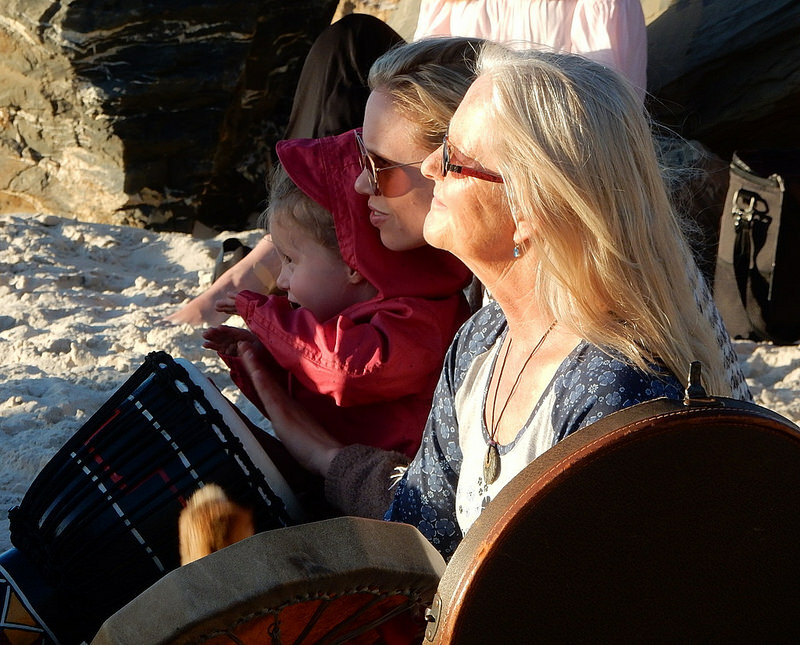 Often they form their drum circles through music, shared work, and mutual delight. Still, the Spirit enjoys inclusive drumming and seeks to promote it on earth as it is in heaven. The Spirit also enjoys the drumbeats of the more than human world: the vibrations of the minerals and plants and animals on earth, to be sure, and those of beings that exist in other planes. Angels and spirit beings have drum circles, too. The purpose of angels and prophets - drummers themselves -- is to help us hear the divine rhythms. Nevertheless, we can hear the rhythms ourselves, even apart from their guidance, when we listen, for example, to the sounds of insects and the lapping of waves on the surf. Or when we listen tenderly to the voices of others, letting the tell their stories. A "facilitated" drum circle is a form of group drumming in which a person seeks to focus the intent and improve the quality and effect of the activity, making it easier for people to effectively participate by taking a more directive approach. The facilitator (leader) takes responsibility for the physical space, arranging chairs and instruments to optimise communication and connection in the group. He or she may provide a range of instruments to create a full and balanced percussion orchestra. 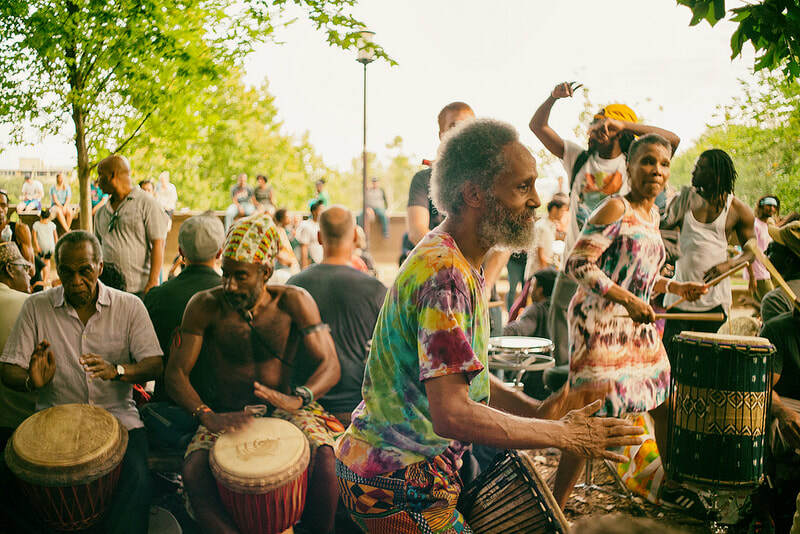 In this way, the experience can be thought of as a "standardized drumming circle," as opposed to the more free-flowing and open community drum circle. The facilitator is constantly monitoring the music in the group, and generally being encouraging and accepting of participant ideas. In this way, the facilitator takes on a role similar to that of a music teacher or drumming instructor whose goal it is to empower the participants and encourage them to share their ideas. At the beginning the facilitator directs the music through verbal and non-verbal cuing. Cues, which often mirror the movements of an orchestral conductor, are directed at the participants, who respond to the leader. This creates a leader/follower dynamic between the facilitator and participants.